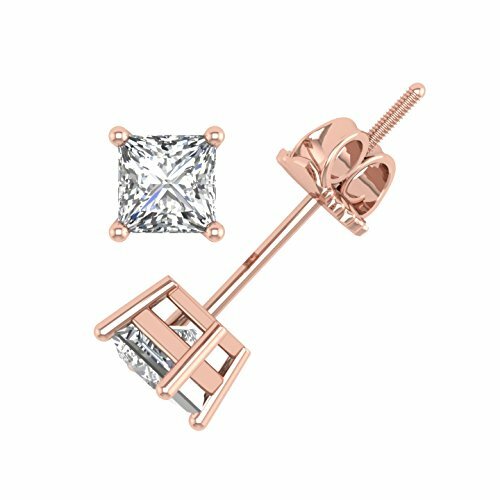 PARIKHS Princess Cut Diamond stud Promo Quality Screw Back (Color - LMNO, Clarity - I3) 0.25ct each stone (total 0.50ct), hand-set New York City with 14k Rose Gold 4 Prong setting. The Screw Back uses a post that is threaded enabling the backing to work like a screw which can be rotated until it is fully screwed onto the ridges for a tight fit. They are an excellent solution as an earring backing for an active woman who likes to wear valuable earrings. They provide maximum safety and peace of mind. PARIKHS offers a wide variety of selection genuine diamonds for studs, Pendants and Sets to suit everyone's needs. Please check our other listings with different diamond quality: Plus - I3-I4, Promo - I3, Popular - I2, Prime - I1, Premium - SI2, Prestige - SI1, Privilege - VS2 Please note that 0.04ctw to 0.07ctw are very small baby size diamond stud and is suitable for the second or third ear hole. IGI Certified from 0.70ct & above by GIA Certified Graduate Gemologists. If not satisfied for any reason, you may return the product to us (unused) for a full refund within 30 days. 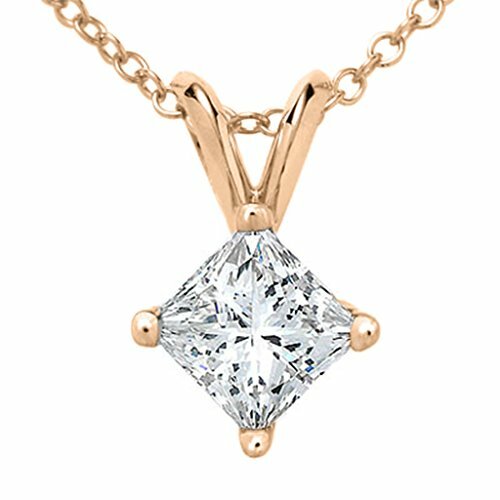 PARIKHS Princess Cut Diamond Solitaire Pendant Plus (IJKL, I3-I4) 0.05ct, Hand-set in New York City with Rose Gold 4 Prong setting. Packaged into a fabulous box for your storing pleasure. Each and every Diamond is verified Conflict free Diamond . PARIKHS offers a wide variety of selection in Diamond Stud, Pendant and Set. From our Privilege to Plus quality there is a Stud, pendant or set to suit everyone's need. If not satisfied for any reason, you may return it to us for a full refund within 30 days. 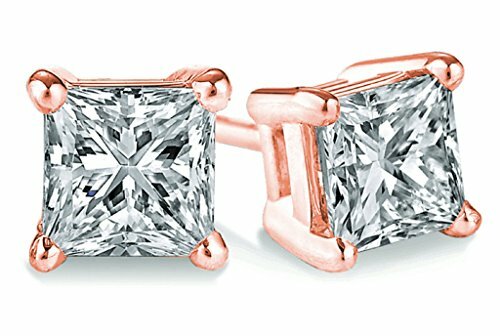 PARIKHS Princess cut Diamond stud Plus Quality (Color- IJKL, Clarity - I3-I4) 0.04ct each stone (total 0.08ct), hand-set in New York City with 14K Rose Gold 4 Prong setting. PARIKHS offers a wide variety of selection in genuine diamonds for studs, Pendants and Sets to suit everyone's needs. Please check our other listings with different diamond quality: Plus - I3-I4, Promo - I3, Popular - I2, Prime - I1, Premium - SI2, Prestige - SI1, Privilege - VS2 This Princess cut diamond might be a groove stone. Please note that 0.04ctw to 0.07ctw are very small baby size diamond stud and is suitable for the second or third ear hole. If not satisfied for any reason, you may return the product to us (unused) for a full refund within 30 days. That extraordinary woman deserves an exceptional ring, and whether you are celebrating the beginning of your fairytale or your happily ever after, this 1/4 cttw diamond wedding band is the perfect accessory. 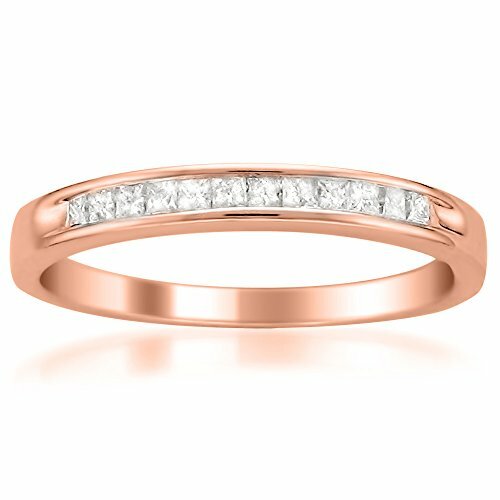 A stunning 12 Princess-cut diamonds are channel set on a gleaming 14K rose gold band. Additionally, we guarantee our diamonds are conflict-free and in accordance with the Kimberley Process Certification System, a UN-backed practice that certifies that origins of our diamonds are from sources free of conflict and acquired through friendly mining. This 1/2 carat diamond three stone ring crafted in Solid 14k solid white gold, A classic 9 stone diamond ring with 3 center stone featuring I-J-K color and I2 - I3 clarity. It is a perfect ring for daily wear. Ring expresses the harmony of delicacy luxury in diamond design. Perfect Gift : Our proposal ready engagement rings are a perfect gift for someone you love. Shop With Confidence: This diamond ring comes in a beautiful gift packaging. And we offer 30 days complimentary service and money back guarantee. 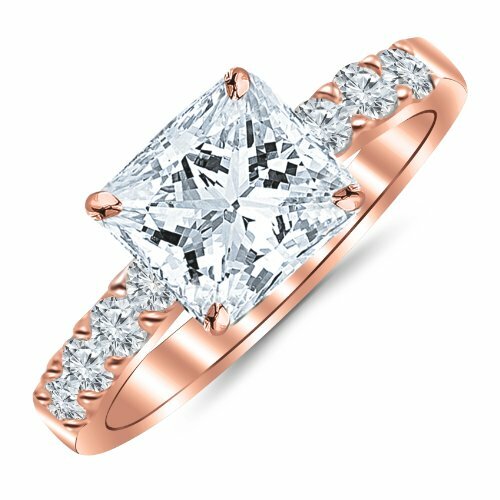 1.10 Carat Princess Cut/Shape 14K Rose Gold Classic Prong Set Diamond Engagement Ring with a 0.60 cwt, I-J Color, Eye Clean Clarity Center Stone. Side Diamonds on Engagement Rings are G-H Color SI1-SI2 Clarity. 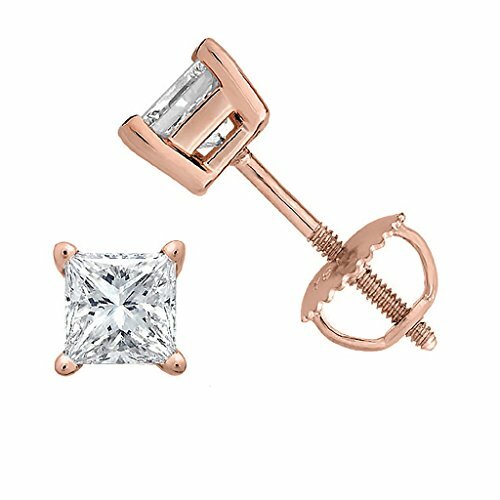 PARIKHS Princess Cut Diamond stud Popular Quality Screw Back (Color - JKLM, Clarity - I2) 0.125ct each stone (total 0.25ct), hand-set New York City with 14k Rose Gold 4 Prong setting. The Screw Back uses a post that is threaded enabling the backing to work like a screw which can be rotated until it is fully screwed onto the ridges for a tight fit. They are an excellent solution as an earring backing for an active woman who likes to wear valuable earrings. They provide maximum safety and peace of mind. PARIKHS offers a wide variety of selection genuine diamonds for studs, Pendants and Sets to suit everyone's needs. Please check our other listings with different diamond quality: Plus - I3-I4, Promo - I3, Popular - I2, Prime - I1, Premium - SI2, Prestige - SI1, Privilege - VS2 Please note that 0.04ctw to 0.07ctw are very small baby size diamond stud and is suitable for the second or third ear hole. IGI Certified from 0.70ct & above by GIA Certified Graduate Gemologists. If not satisfied for any reason, you may return the product to us (unused) for a full refund within 30 days. 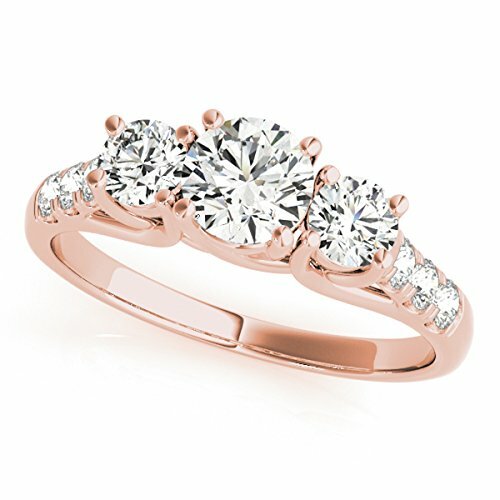 Looking for more Rose Gold Princess Diamond similar ideas? Try to explore these searches: 50s Style Polka Dot Dress, Gold Ruby Solitaire, and One Dc Power Cable. Look at latest related video about Rose Gold Princess Diamond. Shopwizion.com is the smartest way for online shopping: compare prices of leading online shops for best deals around the web. 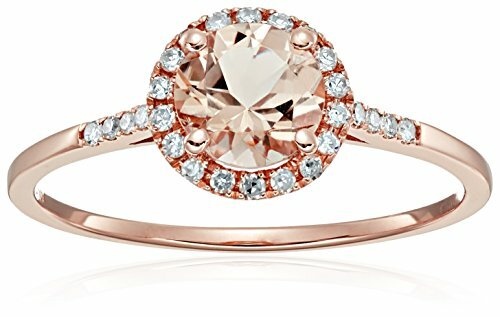 Don't miss TOP Rose Gold Princess Diamond deals, updated daily.